Our new app for iPad: "Light Bouncing – Photographic Lighting"
The innovative iPad app, "Light Bouncing – Photographic Lighting," is a must-have for photographers using light as a creative design element. The app clearly and interactively demonstrates how the lighting of a subject and the resulting shadow effects can be changed by using reflectors. Compare the effects of the different fabric surfaces to one another, and see how lighting and shadows change depending on the angle and position of the reflector. Discover the fine nuances of light and shadow by comparing actual portrait scenes with different lighting. 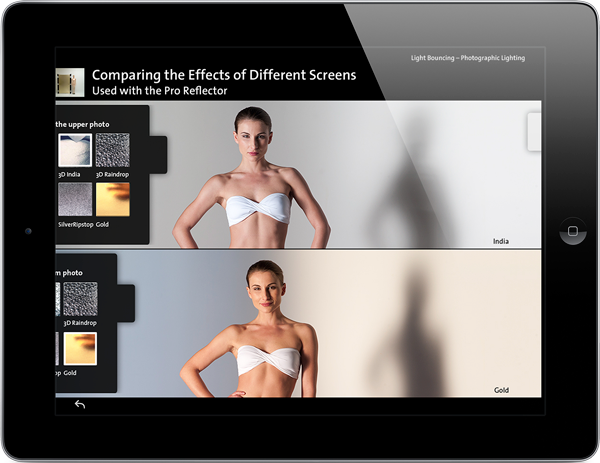 The iPad app includes over 50 screens with more than 260 photos taken using the comprehensive reflector and diffusor system from Sunbounce. In addition to the unique comparisons of different reflectors and fabric surfaces, it also provides fundamental knowledge on topics such as light, shadows and lighting. 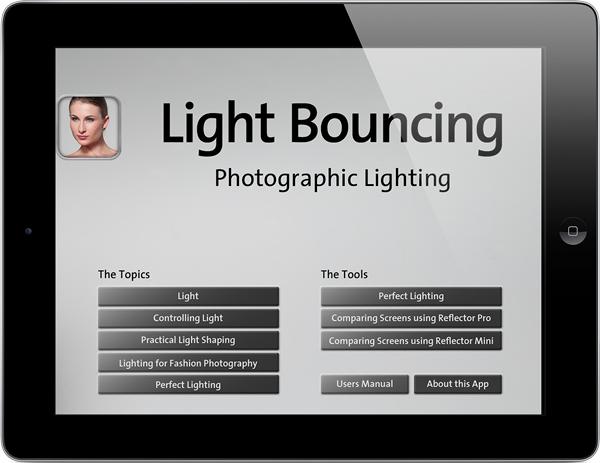 "Light Bouncing – Photographic Lighting" is available on Apple iTunes Store, both in a German and an English edition. Enjoy with this app the outstanding quality of photos on the iPad! From start screen you can get with one tap to the desired subject or tool. Choose here the Sunbounce reflector (size and fabric) for which you would like to compare the various positions. The interactive screen visualizes the modulation of subject lighting and shadows with the selected Sunbounce reflector. Touch a button to change the position of the reflector. Compare subject lighting and shadows using different surfaces with the same setup.